Other Distinguishing Features: Tech is a mechanical entity. 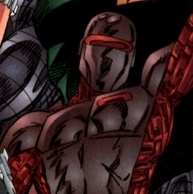 NOTE: Tech created by Erik Larsen, with help from Keith Giffen and Victor Bridges. Tech was created by Chelsea Nirvana shortly after she obtained the powers of Johnny Redbeard. She and the Inhabiter needed some superhuman back-up and made the Henchmen, recruiting criminals that had previously served her father, Dr. Nirvana. These enforcers accompanied them and Freak Force in liberating the MMMS camp to form a large army of freaks. Following the liberation of the MMMS camp, the Henchmen were folded into the army led by Chelsea Nirvana. They attempted to seize control of the Vicious Circle during the Gang War but ultimately failed. Following his leader’s neutralization at the hands of Negate, Tech was inducted into the Vicious Circle and pledged loyalty to CyberFace. In the wake of the Nega-Bomb explosion caused by DarkLord and the Covenant of the Sword, Tech was reverted back to a normal human. Tech was then later killed along with the rest of the population of Earth when Universo consumed this version of the planet.